I’m writing a talk this week on Psalm 124 – one of the Songs of Ascent. I thought I’d write this in an attempt to express my thoughts on the psalm concisely. The key verse – the chorus if you like – of this psalm is the last one. ‘Our help is in the name of the LORD, the maker of heaven and earth.’ The aim of this song is to help us as God’s people to sing this tune on our dangerous journey towards the new Jerusalem. So imagine you’re on your way up on your yearly journey to Jerusalem, to go and celebrate the Feast at the temple of the LORD. But it’s a dangerous journey. Robbers lie waiting in the woods to ambush defenceless pilgrims. As you walk through the dark forest, and find yourself peering desperately into the black spaces between the trees, you strike up this song to encourage your little group. The song looks back to a time when the danger was even greater. In fact, the odds were overwhelming. Disaster was a split-second away. The poet uses a particular technique to remind us how bad the danger was. He uses a group of three lines, all saying the same thing, but increasing in intensity. We go from flood to torrent to raging waters. They threaten to engulf, to sweep over, to sweep away. The waters are stilled, the lions’ mouths are shut. The LORD has intervened. V7 gives us a final image, impressing the psalm’s wonder at our miraculous escape on our minds. There’s nothing as free as a bird. And there’s nothing as pitiful or vulnerable than a trapped bird. 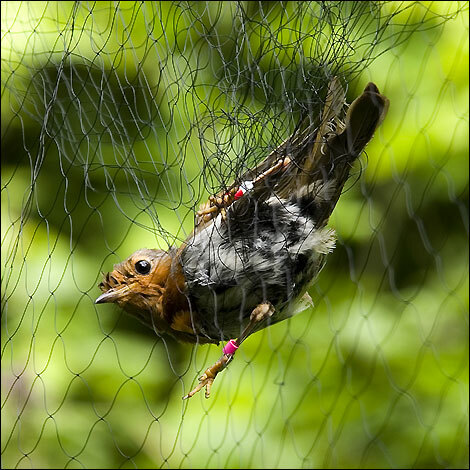 The bird flies blindly into the netting and is trapped. As it wriggles and flaps it only tangles itself up even more. All it can do is wait for the fowler to snap off its life. And Israel was like that. Caught in a net. No human hope. But incredibly, Israel escapes! Did you notice how the poet uses a mirroring technique to emphasise the feeling of unexpected freedom? And the deliverance is all God’s. His people were completely trapped, but God intervened and his people escaped.